Lucky Dino Review: Claim 20 No-Deposit Free Spins! No credit card, no risk sign-up 86% of new players recommend this casino 40 new players chose this casino today! Join Lucky Dino and you can claim an exclusive no deposit bonus for CasinoSmash readers, as well as up to €400 in bonus cash to play all featured slots! In addition to a generous welcome bonus you will find a great collection of casino games and excellent customer support at this fresh online casino. All new players at Lucky Dino are in for a treat: a welcome bonus that includes free spins as well as a deposit match bonus! Claim up to €400 & 100 Free Spins on Deposit + 20 No Deposit Free Spins! At Lucky Dino there are quite a few bonuses available for new players, and exclusive for CasinoSmash members is an additional no deposit bonus of 20 free spins as soon as you set up an account through any of the links on this review! Once you’ve played with your free spins and are ready to deposit some cash you can claim 100% up to €200 with your first deposit. Not to mention that you will get another deposit match bonus of 50% up to €200 once you make your next top-up! Moreover, Lucky Dino uses gamification to further enhance your experience as a player. As you play your favorite games you can collect additional bonuses and bounties! 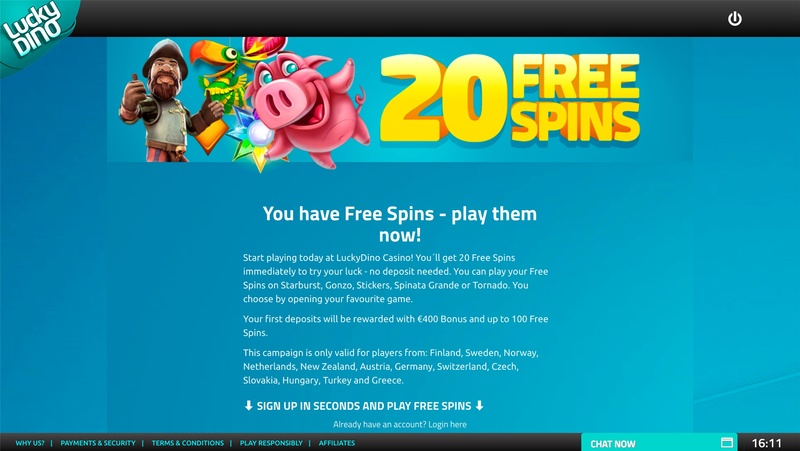 + 20 No Deposit Free Spins! Featuring titles from leading casino game developers like NetEnt, Microgaming, Scientific Games and Play n' Go, there is no shortage of entertainment at Lucky Dino! Lucky Dino’s game collection includes plenty of new titles including hits like Jungle Jim, Dragonz, Hitman, Big Bad Wolf and Immortal Romance. In addition to the usual set of favorites, there are also some lesser known gems available to play. While you may not find traditional casino games at Lucky Dino, you will find some arcade style titles under the Special games section including Germinator and Triangulation. Another entertaining and fun take on the classic game of keno. While there is no smartphone app for Lucky Dino fans, you can enjoy the casino site’s games and features on a fully functional mobile version of their site. Continue playing slots from anywhere whether you’re using an iOS, Android or even Windows powered smartphone or tablet. As a Lucky Dino member, you can contact casino customer support in English, Swedish, Norwegian, Finnish or German depending on the language you prefer. Their team is available and ready to help with any questions or concerns via live chat available from any page on their site. While they may not have the biggest collection of games around, they make up for the quantity with quality titles and unique arcade betting games. That coupled with a great welcome package for new players makes it definitely worth a try for fans of colorful casino slots! There are many deposit options on Lucky Dino. You can choose the most convenient one for you. 1. Bonus money can only be paid out once it has been transformed into real cash. If an account contains both the player's own money and bonus money, player's own money will be tied to the bonus until the wagering requirement is fulfilled. Specific bonus conditions may be published on the website with the launch of different bonuses. If nothing else is stated, the normal bonus terms and conditions will apply. Before fulfilling the bonus wagering conditions, if you transfer or withdraw the initial deposit amount, bonus amount and all winnings from this bonus will be forfeited. If any bets were placed with bonus balance, bonus no longer can be cancelled. where devices are communal f.ex universities, libraries etc. unless specified otherwise. 3. Signup bonuses and free spins which don‘t require deposit, as well as the third party promotion free spins and bonuses are subjected a maximum cashout of 500 €I£/$, 5000 SEK/NOK. 4. The Company reserve the right to void any awarded bonuses if they have not been used for 1 (one) week from the time they were awarded. Some bonuses may have shorter validity time which will be specified under Bonus Requirements. 1. The Company reserves the right to confiscate any funds and close a Player's Account should any evidence of bonus abuse or fraud be revealed. 2. Special promotional campaigns may have different bonus requirements. Such information shall be available to a Player in the campaign description. 3. If a Player has bonus money on his/her Account, every bet the Player places will first be of the Player’s real funds, and any winnings will be contributed to the bonus money. The Player will be able to withdraw the winnings only when the wagering requirements have been met, or by forfeiting the bonus and withdrawing the remaining real funds. 4. A Player's winnings contributes only to the bonus money before the wagering requirements are met. 5. There is no wagering requirements for the free spins winnings. 6. Free spins that come from the deposit promotions bonus will be credited on the following day by 12:00 CET, or as stated in the promotion description. 7. All deposit bonuses will expire in 7 (seven) days if not completely wagered. Reload bonuses and free spins need to be wagered within 7 (seven) days. 8. You will lose all winnings (except your deposited funds) if You don't meet all wagering requirements in the specified time frame of 7 days. Joker - 0% All Jackpot slots - 0%. All Live Casino games - 0%. All other games ~0%. 10. Free spins do not contribute to wagering requirements. 20 (twenty) EUR, 5 (five) EUR will be counted towards wagering. If a player bets during active bonus more than £5 stake in a single game round, share of profits is added to additional 50x wagering requirement. While playing with bonus money only 5 (five) EUR & GBP, 50 (fifty) SEK & NOK count towards any other promotion tied to wagering amount. 12. If You do not want to use Your bonus money, contact our support team. 5. LuckyDino reserves the right to request a Player to make a deposit should the Player have only the winnings accumulated from free money or free spins. 6. 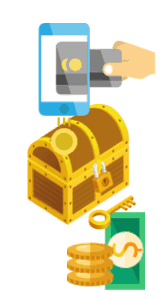 For some deposit methods, namely Skrill, Neteller and Paysafe cards, deposit bonuses are not available.